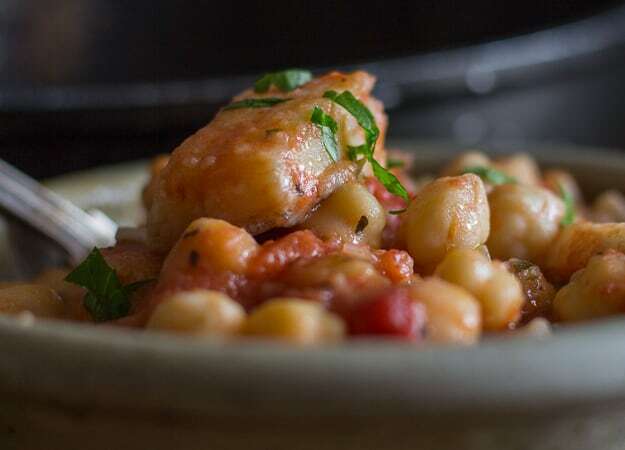 Baccala this Traditional Italian Recipe is made with chickpeas, spices and simmered in a delicious Tomato Sauce. Served with some crusty Italian Bread makes this a perfect Comfort Food Dish. With the arrival of Lent a lot of people will be making and serving Fish Dishes. This Skillet Baccala is one my mother-in-law always made. I think I have made this recipe one or two other times, and that was when I just got married. I guess I wanted to impress my husband with one of his mother’s most loved recipes. The reason I never made it very often was because whenever Maria made Baccala with Chickpeas, she would always send over a good sized helping. But since she is not well and doesn’t cook anymore I decided to make my own. 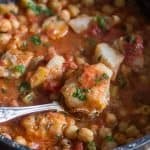 More Fish Recipes you may enjoy! 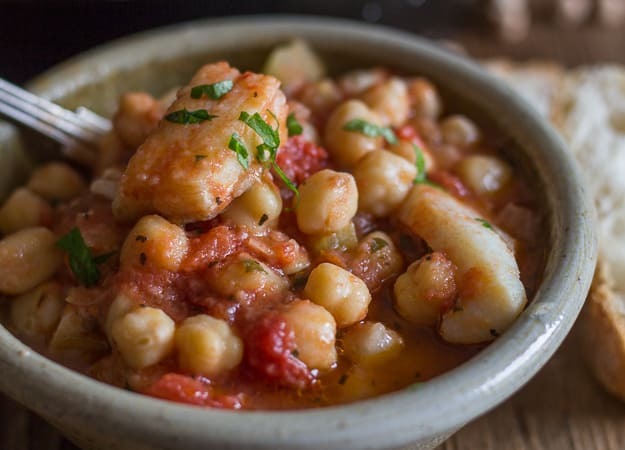 So the other day when I was in the supermarket, I purchased some dry Baccala and chickpeas, and then I called my sister-in-law to get the exact recipe …. Place the dry Baccala in cold water, (make sure it’s covered). Change the water 2x a day and soak for 48 hours. The last 8 hours soak the chickpeas. Dredge the pieces of fish in flour and then lightly fry before adding to the sauce. Cook the chickpeas separately before adding to the sauce. If sauce is too thick add a little Chickpea water to thin it out. Best advice, buy the fish already soaked so no deboning or cleaning will be necessary! My mother-in-law used to add her cut up Baccala right into the sauce, but I decided to lightly brown it before to give it a richer flavour. And I think it worked because this Baccala Recipe was amazing if I do say so myself. Oh and the Italian said so too! Buon Appetito! 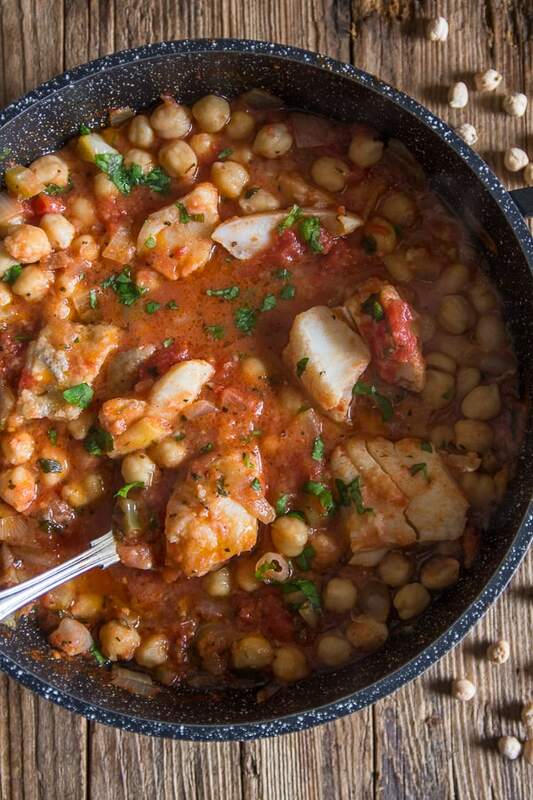 Baccala this Traditional Italian Recipe is made with chick peas, spices and simmered in a delicious Tomato Sauce. Served with some crusty Italian Bread makes this a perfect Comfort Food Dish. If you are using dried Baccala, then soak it in cold water for 48 hours, be sure to change the water 2x a day. Once the time has passed then open the fish lengthwise, remove the bones and all plugs and cut it into pieces (about 2 inch pieces). Soak dry chickpeas for at least 8 hours, drain and cook in boiling water until tender. In a large skillet or pan add the olive oil, chopped onions, celery, garlic and parsley, sauté for approximately 3 minutes. Add the can of tomatoes, basil, hot pepper flakes and water. Stir to combine. In a medium pan add 1 tablespoon of olive oil, lightly coat the baccala in flour and fry lightly on both sides. 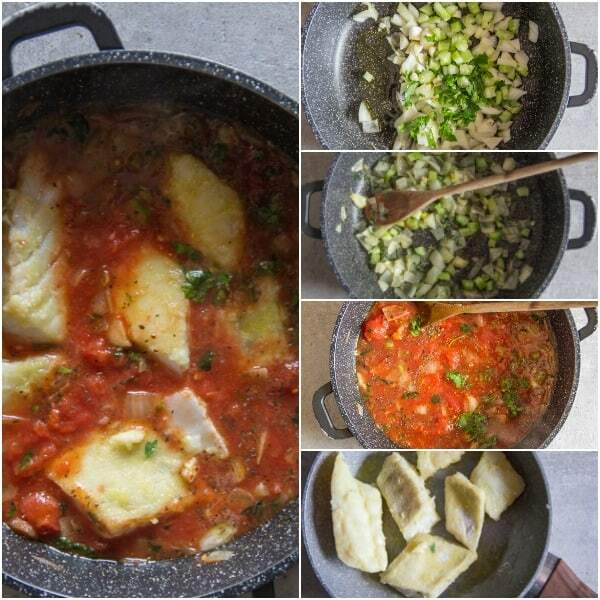 Add to the tomato mixture and cook for approximately 20 minutes or until fish is cooked. Add cooked chickpeas and a little chickpea water if mixture is too thick. Stir to combine and heat thoroughly, serve with Italian crusty bread. Enjoy. I was raised on baccala but we never had it with chickpeas. Perhaps that is a southern Italian thing? 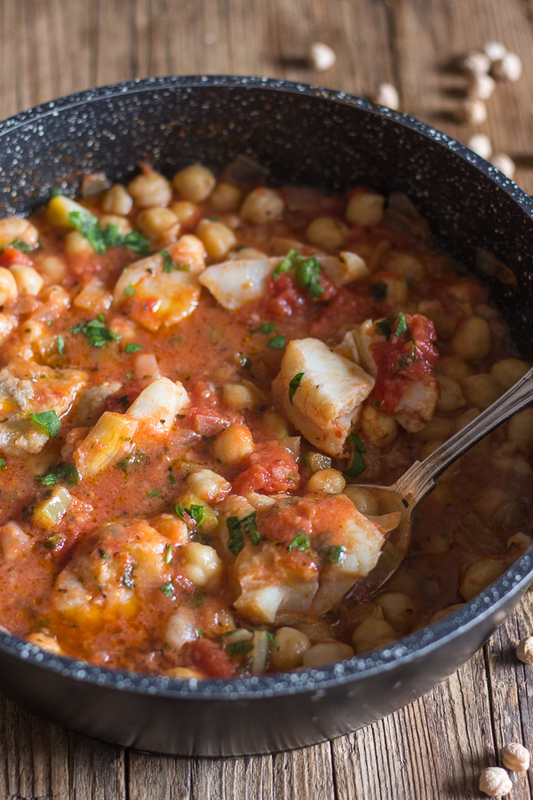 Nevertheless, our whole family loves baccala.I pinned the recipe to make when I can get my hands on some salted cod. BTW, how are things going? Hope all is well. Un abbraccio forte. Hi Marisa, this was my mother-in-law’s specialty. She is actually from Central Italy (Frosinone) so I imagine that’s how her mother made it. Thanks things are good. I hope with you too. Un abbraccio forte anche a te. Have a wonderful Sunday.